There was a melee at the check in counter when we arrived at the IGI airport in Delhi. The reason was not clear and instead of the regular queue I saw a group of passengers talking to the ground staff in agitated voices. Soon I learnt the reality that the Austrian Airlines flight to Vienna had been cancelled due to a technical snag and the airlines were trying to allocate the passengers to different airlines based on their destinations and further connections. Some lucky ones got earlier flights by other airlines and by the time our turn came, we were allocated KLM flight via Amsterdam. Instead of leaving past midnight, we finally boarded the flight in the wee hours of the morning. We arrived at Amsterdam and got the bad news that we had just missed the connection to Athens! We would have to wait till late afternoon so the only option was to dump the luggage at the airport and head for the street. We passed through the immigration and went to explore the lovely city of Amsterdam as the sun was just rising. Later in the afternoon, we boarded the flight to Zurich and arrived two hours later, but not before witnessing the glorious sunset behind the Alps, covered with snow! Sapped, we boarded another flight to Athens and by then I had lost track of the time. Groggy and tired I realized that past midnight the aircraft had landed in Athens. The final destination was Herakilon, Crete so one more flight to be taken and this time a change of airport was involved too! Past midnight we boarded a taxi to the local airport and were informed that our baggage had been waylaid and would reach us later. We arrived at the local airport in Athens to board a domestic flight. The taxi zipped passed the neon lit street with hoardings in Greek and believe me it all was Greek, not a word understood!! First time the Greek currency Drachmas exchanged with taxi driver to settle the bill (prior to Euro days!). The day was breaking when the small aircraft took off for Heraklion! The Mediterranean and Aegean Sea kissed sands were alluring from up above as the aircraft descended into Nikos Kazantzakis Airport! The airport is named after the famous author of the classic ‘Zorba the Greek’, who was born here! A short ride of 5 km through the small quaint town brought us to the sprawling hotel complex overlooking the Venetian port next to the Archaeological Museum. Two nights had gone by to reach this part of the world! One of the longest flying times including transit without ever crossing Atlantic or Pacific oceans! Heraklion is the capital of Crete, the biggest of more than 1200 islands, and one of the Mediterranean region's most fascinating and vibrant cities. It is full of places to discover. 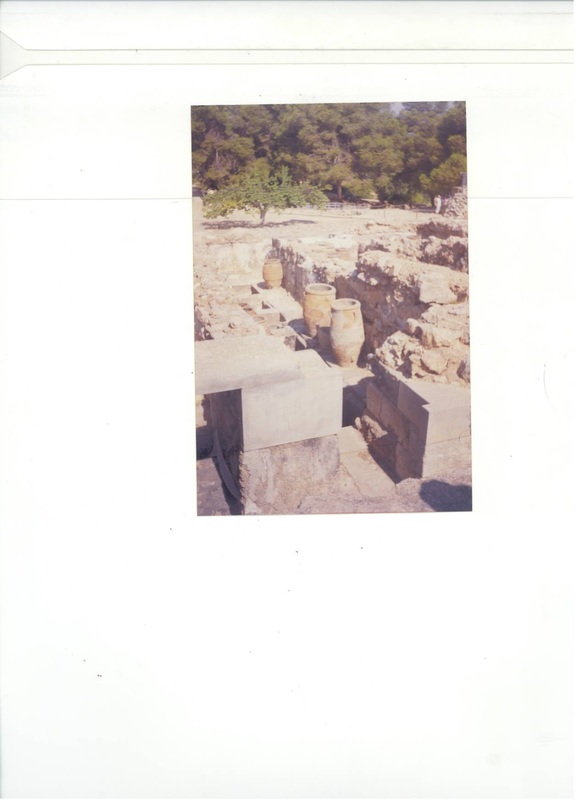 The city is linked with the Palace of the Knossos, Byzantine churches and the Venetian fort. 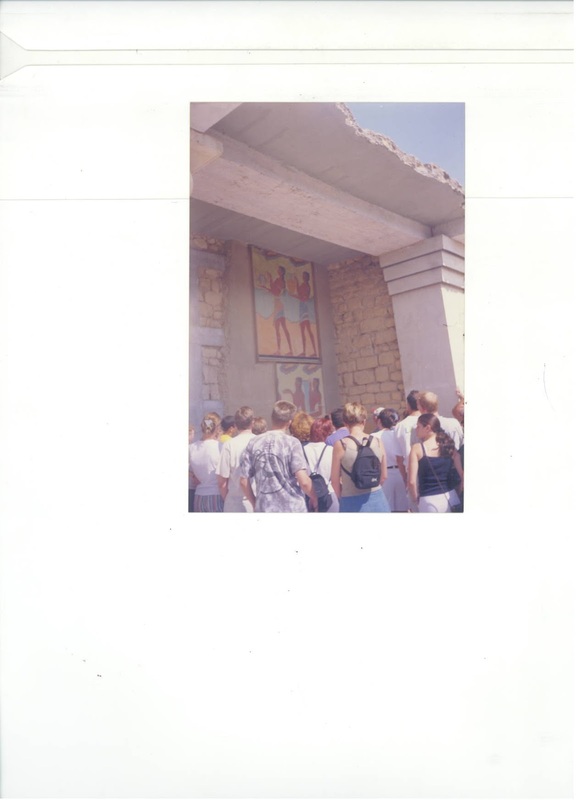 Knossos was the legendary seat of the Cretan King Minos and has excavated ruins, a crumbling palace, beautiful paintings and Labyrinths. It was in a cave of Crete where the goddess Rhea hid the newborn Zeus. In that cave, Zeus was brought up by the nymphs while the demonical Kouretes would strike their shields loudly so that Cronus may not hear the crying of the baby Zeus and eat it. It was also to Crete that Zeus, disguised as a bull, took Europa so that they may enjoy their love together. Their union produced a son, Minos, who ruled Crete and turned it into a mighty island empire of the seas. The stories of the Greek mythology are as fascinating, as of any other culture and I was allured into buying one such book ! The city has a number of Museums which depict the history of the bygone era and one needs at least 2 to 3 hours to go around and get soaked in the Greek history and mythology. Amoudara or the city beach is a long stretch of sparkling blue sea and pristine sand. The sundrenched beach with holiday makers is a delight to spend time lazing around and enjoying the sunshine. There are a number of islands like Myknos, Rhodes, Corfu etc where one can visit in the boat. To get a firsthand experience of this, we took a boat to a nearby island for a splendid journey! The boat rocked in slightly choppy sea and on reaching the island we were awestruck with the beauty of the uninhabited place. The group decided to take a plunge in the water and one of the newly married couple ventured a bit farther soon to realize that there was no sand under their feet! We managed to rescue them before it was too late! The hotel room overlooked the sea and there was thick foliage of trees. As the night fell, there was a natural humming sound which was quaint. We were told next day by the hotel staff that the musician insects were Cicadas!! The trees around abound with colony of the insects which were otherwise harmless! There are many more places of interest in the quaint town and a visit to a Greek restaurant for the food is a must! The Greek salads, Feta Cheese and Olives are very inviting! We had planned a stopover at Athens where one friend had a house! So the group bundled into his house and ransacked the kitchen as he and his family was away on vacation to India! 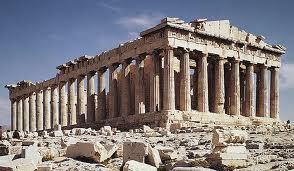 A visit to Parthenon, the Acropolis, and the spectacular views of the city was memorable. The place is full of tourists at any time of the year and the thousands of years old structure conforming to the ‘golden ratio’ leaves one spell bound in awe! The local flea market around the Acropolis hill is fascinating where one can buy traditional items like fur shoes, golden pottery, olives, jewelry and a horde of other things! One can never have enough of Greece and the place is full of mystery and aura which serves like a magnet to the rest of the world. I feel that this is surly one place one can visit anytime for the things it has to offer, besides ever smiling friendly people. Thanks Jaishree that you liked this travelogue! Well dear Rahul your journey sounds as if it was harrowing but the rewards of the destination were well worth it. A very interesting read my friend, I have seen photos and documentaries of the Islands of Greece and it certainly is a very beautiful place. It was definitely worth all the trouble of travel to this lovely destination, Dianne! Greece is one of the places on my list of places to visit. I have always heard wonderful things about it and I just can't stop envying people who visit it. Wonderful post as always, Rahul. Thank you, Panchali and yes the country is very rich in heritage and history that is preserved well! Oh, one of my dreams is to visit Greece. Your travel posts are a treat, Rahul. Book, please! Just pick all your travel posts and offer it as a book. true.. Zeus, Poseidon, Hades... Greek mythology is full of fascinating characters as ours.. Absolutely Jyoti! The Greek mythology is replete with characters we would have come across some time or other in our lives! What lovely shots - and as soon as you got to Greece, it seems as if you forgot the hassle with the late/cancelled flights. True Lady Fi! The hassles were forgotten just on arrival there! Nice one. Love to go there. Thanks for the tour. I love reading about mediterranean because I want to visit some time :) Nice report. A story well narrated. Yes Greece is a mesmerizing place full of magical myths and great historical characters. Thanks Rama! What you say is absolutely true! Thanks for giving us a virtual tour of Greece through your eyes. Fascinating and interesting! oooh lovely .. lovely pictures and what a place to go to .. good the travle mishaps did not put you offf ..
Greece indeed sounds fascinating Rahul sir. I am intrigued more now, to visit this post. That story about Zeus had me hooked, no wonder you decided to buy a book. Wonderfully narrated! You must plan a visit there and can assure you that you will be rewarded! Oh! Thanks a lot Jemina for that lovely comment! Am honored! Lovely post. You sold me Greece. Would love to visit someday. Thanks a lot for such a generous comment Ramya! It is alwyas a pleasure to recount the tales of the journeys undertaken with friends who are so appreciatve:)I assure you that you will see many more exotic places in your lifetime! Wow I hate the horror of delayed flights. But I guess everything went off well at the end and it was full worth it. Those are the perks of travel to land at a place that was not on your list!! It was difficult to select the pictures for the post but agree some dazzling pictures of the beach would have added more color to the post, Ashwini:) Thanks a lot for your nice comment! Wow Rahul.. that was a fantastic trip. I could literally see the places through your words and they looked beautiful. I could only imagine how pristine and lovely they would be for real. I am definitely planning a trip to Greece very soon. Lovely post and I really loved your tidbits about history which added a lot of flavor to the place and the trip. Thanks a lot Raj for that comment!Hope you see the beautiful country soon! This island is so fascinating! I hope to visit it very soon! Welcome to my blog Benedetta! Thanks for that nice comment!! This is a facinating country and so Munch history. I like your writings from the tour. Thanks for the lovely post Rahulji! Its always so full of information. Thanks a lot Shreya for liking!! Hi Rahul, hope you are well and the year has gotten off to a great start for you. The journey getting to Greece was such a long and complex one! I guess the bypasses and layovers all make the journey that much more interesting. And the treasures you discovered after finally reaching there seem so magnificent and endless. 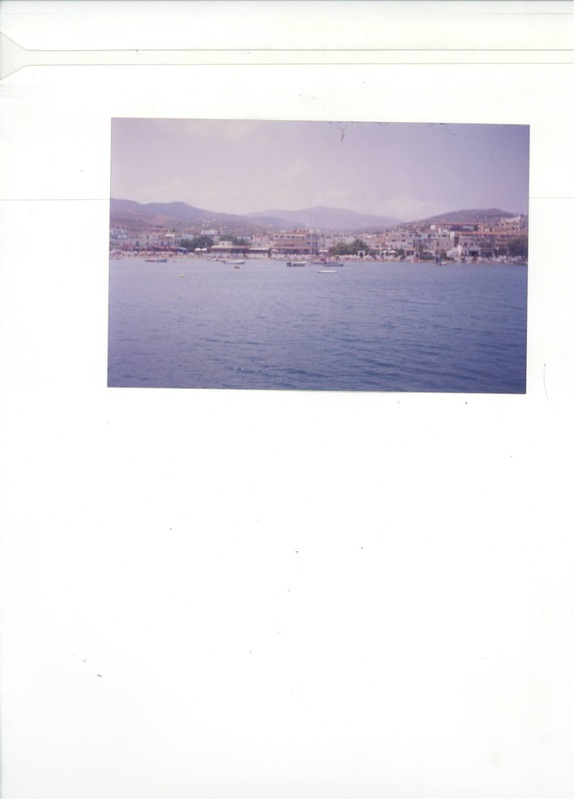 You've painted a beautiful picture of Crete, I wish to visit someday. Sam, had visited the place some time ago but am happy you enjoyed the read. Sometimes the journey one undertakes get extended unreasonaby long but when you look back you find how much you saw and learnt in the process:)Hope you travel to Crete soon without so many hassles!! Thanks for your insightful comment today...have a good weekend! Thank you Sam. A happy weekend to you too! Thank you Zephyr that you liked the post! So much information, I really enjoyed it. Sorry for the late comment, I thought I had already posted my comment, for I had read it the same day you had posted it. Greece is indeed the most beautiful country, did you try the famous drink Ouzo, I got a bottle of it from my daughter who had gone there for her honeymoon, some 3 and half years back. The bottle itself was so cute. Like everyone else it is also in my list of places to visit. The first picture is very good. How you would have wished there was digital camera in those days. Crete is so beautiful, I've been there once and I love it! How nice that you have been ther Alessia! what an adventure!!! you have a great way of making the best of every situation! goodness what all troubles u take for ur passion for travelling. SO many flights! I wonder u dont get hassled by so much of air journey. The post was very informative on the island. Well narrated the travelogue... your flight journey sounds very tiresome. It turned down my thought that flight journey is very easy. Its one of the destinations I have read about in books. I agree with you Rahul that every journey is unique, it comes with its own set of experiences. Thanks a lot Rachna! 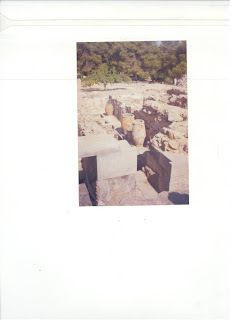 !Greece has so much documented history it is just beyond imagination! Is there any place in this world that you haven't visited? Thanks for taking me there virtually for FREE haha, it is on my to do list.. lovely read as always! Ah, now I want to visit Greece too. I really enjoyed reading this travelogue. Although I was sorry there was all that confusion about the flights, I'm glad it brought about other interesting experiences. And the bags were waylaid on top of all that? That's totally unfortunate. I was wondering why Mykonos sounded familiar and then I remembered a winery building that had 'Greek' written all over it. From afar I saw this white structure and it reminded me of pictures from Greece, that I'd seen. I later learnt that the owner of this winery in Napa actually lived in Mykonos and that was what inspired the building of this winery. A big thanks, Divya for being able to relate to the post! It is always a pleasure to read your nice comment as I know you are as addicted to travel as I am:) I read you lovely post on the winery and have left my two cent there!! WOW! This is amazing! It is a lifetime experience..I would love to travel to one of these places. Thanks Megha! Lifetime experience indeed:) Hope you travel soon! Wow.. this was a fun read Sir..
U have traveled so much... I am in love with traveling too. Pics were nice but would have loved bigger the better..
A big...g thanks Manjulika for having read my older posts and liked them:) Actually the digital cameras had not really hit the market so had to make do with older camer with a color film:)Am happy to know that you too love to travel!